An unauthorized history of Tubes of Fire. To review Tubes of Fire is akin to reviewing Terry Gilliam’s the Man Who Killed Don Quixote by way of the footage now only available via Keith Fulton and Louis Pepe’s Lost in La Mancha documentary, for all that remains of this once grand project is a three-minute short film. Its legacy to Colorado cinephiles is as a curio in which many diverse talents from C.U. 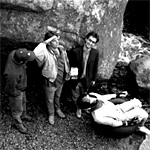 Boulder would merge briefly in the early 1990’s to explore the timeless concept of good versus evil by way of a young man whose enjoyment of floating down the river in an innertube is suddenly challenged by a yuppie kayaker. Several local cartoonists contributed to the story-line; Holley Irvine (Ozone Patrol) provided story boards and a cameo, Hans Bjordahl (Where the Buffalo Roam) contributed ideas and was a member of the tuber’s brigade, and Tom Oling (40th Parallel, U.S.S. Utopia) anchored the entire project with the kind of charismatic star power that shines through even when his lines are muffled by his motorcycle helmet. Certainly the most famous alum of the Tubes of Fire project would be Trey Parker, of South Park fame, and the late Stan Brakhage - who was to film what Gertrude Stein was to literature, J.S. Bach was to music, and Jackson Pollack was to the art world: a prolific and uncompromising, creative genius. Tubes of Fire was shot on 16mm by Chris Graves who, along with Trey Parker, created the American History animated short that was later revamped by Michael Moore and used following his interview with Matt Stone in Fahrenheit 9/11, something that irked the South Park duo. Stone even cites this as the reason they took special pleasure in lampooning Moore in their film Team America: World Police. Kjolseth’s filmmaking aspirations were sidelined by his job working for the Starz/Encore cable channel acquisition department, where he was also a script evaluator. He wrote several scripts and even managed to pitch one (Mutant Carnival) to New Line Cinema, but nothing ever came of it (later, HBO’s Carnivale echoed many of its ideas, but was a huge improvement). The Tubes of Fire project was put on hold until the South Park phenomenon sparked an interest in the Tubes of Fire trailer as its own self-contained short film. Jason McHugh, actor/producer for Alferd Packer: The Musical (later retitled “Cannibal: The Musical”) picked up the Tubes of Fire trailer and screened it in 1998 at Cannes You Dig It?, Canne’s Film Festival barnacle show. Tubes of Fire still gets included as part of the occasional touring short film package, but has never been released to video or DVD. Key lines from Tubes of Fire were referenced in both Orgazmo and South Park: Bigger, Longer and Uncut, but if you blink, you will miss them. Director/writer Pablo Kjolseth still dreams of his Tubes of Darkness project, and has been overheard talking about how he’d like to release a special “Director’s Cut” of Tubes of Fire, which would include sock-monkeys. Drunk and divorced, he’s also been seen stumbling around town, shaking his fist at the clouds and yelling “Damn you, Friedman!” His friends worry about him. Lead man Tom Oling has re-written Tubes of Fire as a trilogy of films wherein the hero, Scott Throbb, gets “lots of action, if you know what I mean,” and describes the project as somewhere between Lord of The Rings and Boogie Nights. Editor Chris Healer does visual effects on feature films (Human Error) and television shows (Peter Jennings Reporting: UFOs — Seeing Is Believing). Various members of the Tuber’s Brigade (Sean Jensen, Tedzo Reitsma, Jon Ecker) could not be reached for this article. The Hot Mamas (Malia Nemecheck, Karen Sperry) are now both real moms. Chris Graves still works on film projects and lives in Denver. Trey Parker currently gets more action than Tom Oling can even imagine. Stan Brakhage passed away March 9th, 2003. He was honored at the Academy Awards, and The Criterion Collection released “by Brakhage: an anthology” that same year. George Hickenlooper has made many films and at the Sundance Film Festival once predicted that his relative, John Hickenlooper, would one day be Mayor of Denver. He was right. David Starr, who played the role of the blood-sucking yuppy, Yorrg the Evil Kayaker, lives in New York City. Jorg Waltje whose voice is dubbed over David’s for Yorrg, wrote a book on vampires called Blood Obsession: Vampires, Serial Murder, and the Popular Imagination. Josh Friedman was a script reader at New Line Cinema until he made a bundle for the script that would eventually become Chain Reaction. He is currently making millions of dollars writing scripts with big effects and a fast pace for Steven Spielberg and Tom Cruise, including War of the Worlds. Upcoming projects also include an adaptation of Black Dahlia for Brian DePalma and work on a pending Terminator television show franchise.